Jeff has ministered to college students at Brown University, Harvard, M.I.T., Boston University, and other surrounding campuses in the Boston Metro area. 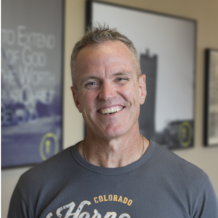 Jeff is a graduate of the University of Massachusetts, Dallas Theological Seminary, and received his doctorate in preaching at Truett Seminary. Jeff and his wife, Nancy, arrived in Waco in the Fall of 1998 to plant Redeemer and have never left. Jeff started The Center to support and train other Bible-preachers to experience and preach Jesus Christ from all of Scripture. Collin has been involved in ministry since high school, holding positions in youth, college, and adult ministry. He has a Masters in Biblical and Theological Studies from Knox Seminary and has been privileged to serve in pastoral roles affording him the opportunity to preach and teach regularly. Collin naturally gravitates towards the study of preaching and helping fellow preachers. Collin overseas operations for The Center.